Nothing more then a little OC preset from yours truly ! Thanks to l550050, AvallonKao, expired6978, AGodComplexPikachu, Aarwyn and ANiceOakTree for there work ! My first file ever eh. So yeah, here's Aurore. For the little story, I never intended to upload her as a Preset. But since I can't seem to play this game, might aswell give her to you guys so she can actually live some adventure. 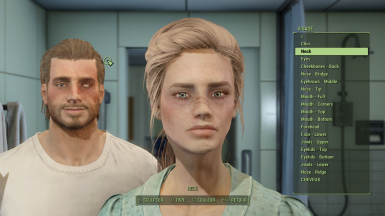 For me, she's a 24 years old woman, born and raised in the Wasteland. Her parents were merchants, so she had to move a lot. And she had to learn how to fight. But it never was kind of her thing, y'know ? At age 16, she decided to stay and live in a little settlement north of Boston. She fell in love with a guy named Drew ( I'll probably post him here too. ) with who she had a little girl named Lys. But nothing good last forever. At Lys 8 birthday, the settlement was attacked and burned to the ground. Aurore was the, seemingly, only survivor. The rest of them was dead. But no corpses of neither Drew or Lys. Believing that they're probably still outhere, she'll do everything to find them. So.. here's the complicated part..
ALL CREDITS GOES TO EACH CREATORS ! 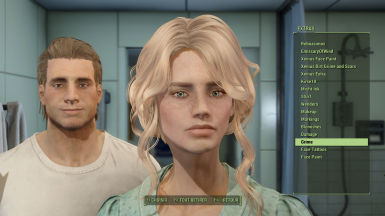 Copy and paste the file of the character you want to use to the following directory: C:)/Program Files (x86)/Steam/steamapps/common/fallout 4/data/f4se/plugins/f4ee/presets. in there. Select it to load the preset. Here you go ! Again, it's my very first file so If it doesn't work, I'm sorry for that and I'll try my best to answer as fast as possible ! Good game to y'all !